A pleasant and generally rather quiet forested state park along the North Santiam River 3 miles west of Mill City, North Santiam State Park sits well off Highway 22 and features an attractive trail system, along with picnic facilities. A paved trail circles through the park, and on the south side, informal fisherman’s trails branch off to the riverbank. An early morning walk along the paved trail generally reveals a variety of songbirds (Spotted Towhees, Song Sparrows, Black-headed Grosbeaks, both crowned sparrows, Townsend's Warblers, Hermit Warblers, Orange-crowned Warblers, Wilson's Warblers, both kinglets, both chickadees, two species of nuthatch, Hutton’s Vireos, Bewick's Wrens, Rufous Hummingbirds, and more. Even more alluring is the well-maintained dirt loop trail, departing easterly from the east side of the parking lot, that leads through a stand of old-growth Douglas Fir; a branch of this trail also dips down to the river and then runs downstream back toward the picnic area. This little-used trail offers a chance for woodpeckers (particularly Pileated Woodpeckers, which nest in/near the park), Western Wood Peewees, Pacific Wrens, Varied Thrush, Red-breasted Nuthatches, both kinglets, various warblers, and even Ruffed Grouse; the river itself is a reliable place for American Dippers. All along the North Santiam River, during spring and summer, keen observers might spot Harlequin Ducks along with the ubiquitous Common Mergansers and Canada Geese. 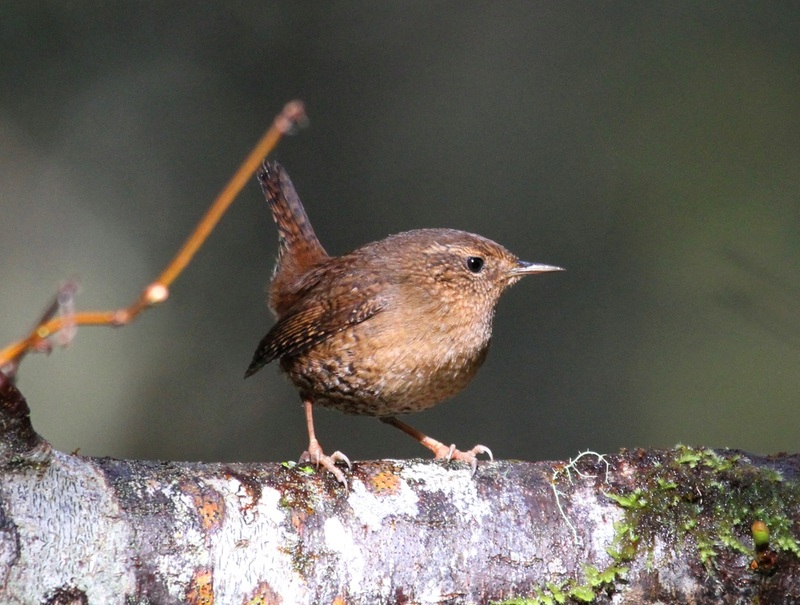 Nearby Fisherman's Bend Campground has the same mix of birds, but is much busier with people; early mornings in May are prime time at North Santiam State Park. 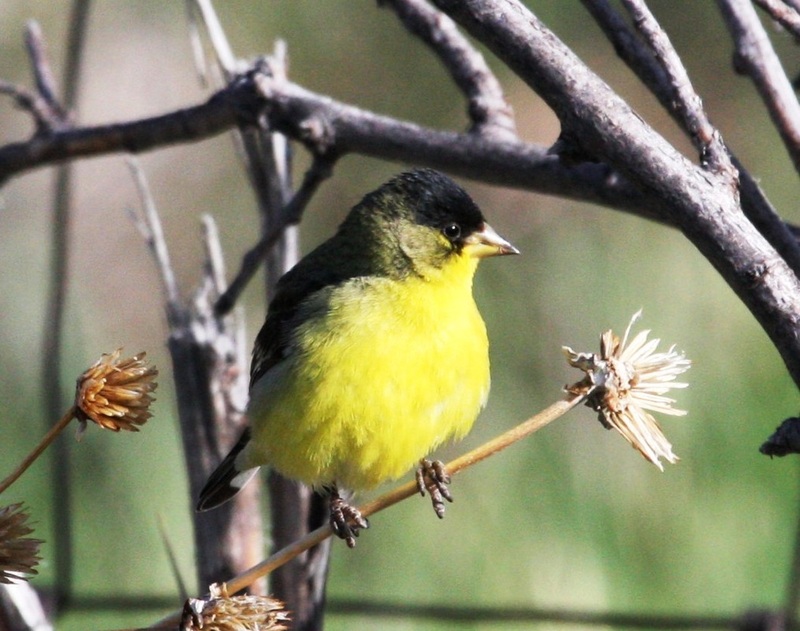 A popular birding stop easy to reach from the town of Sisters, Calliope Crossing is located on Indian Ford Creek, where the riparian corridor is characterized by dense thickets of willow flanked by small aspens and then ponderosa pine. Trails lead along the corridor, ranging from easy walking on dirt roads, to bushwhacking along via deer trail closer to the water. The main road (gravel) fords the creek and provides prime viewing for warblers and others species. For walking along the deer trails on the south side of the creek, wear shoes and pants that can get wet. A variety of warblers are generally easy to watch here in late spring; prime time is mid-April through late May. Typical sightings include yellow, Wilson’s, orange-crowned, Townsend’s, and yellow-rumped warblers; other possibilities include hermit, Nashville, and MacGillivray’s warblers. Black-headed grosbeaks, red-winged blackbirds, house wrens, and calliope hummingbirds nest here, and the surrounding woods attract the songbirds ubiquitous to the Sisters area, including mountain chickadees, red-breasted and pygmy nuthatches, sapsuckers, various sparrows, pinyon jays, western tanagers, Cassin’s vireos, flycatchers, and others. Birdwatchers regularly find unusual species at Calliope Crossing, especially during the spring and fall Warbler migrations, with the list of odd sightings including black-and-white warblers, magnolia warblers, blue-winged warblers, and American redstarts. Generally, during the spring nesting season, warblers, grosbeaks, and wrens are easily seen—or at least heard—from the road immediately north of the creek crossing, where the willows form a dense thicket along the road shoulders. A quiet approach might also yield spring sightings of mallard ducklings and flycatchers. The occasional accipiter hunts the area; northern pygmy-owls show up regularly; merlin have been seen here; and peregrine falcon once flew right over my head. Indian Ford Road to stop next at Calliope Crossing. The bottom of the Lower Deschutes River canyon is almost entirely in public ownership for many miles heading upstream from the river’s mouth, a few miles west from Biggs and Highway 97. The mouth of the river on both banks and the east bank going upstream about 2 miles lies within the Deschutes River State Recreation Area, and this property is contiguous with the state’s Lower Deschutes Wildlife Area. Birders can take advantage of all this public land by birding the easy-access mouth of the river, with Heritage Park campground on the east bank and Heritage Landing day-use site on the west bank, and, for those willing to hike, also by walking the trails that lead upstream. The main trail on the east bank is a service road closed to vehicular traffic, so it makes a nice walking path; as do the various branch trails. The campground area on the east bank and the day-use site on the west bank are both excellent site for a variety of songbirds from late April through mid-May; the species diversity decreases a bit thereafter as migrants move on, but this riparian area nonetheless supports a number of different nesting species, including Bullock’s oriole, lazuli bunting, Cassin’s and warbling vireos, and several warblers. 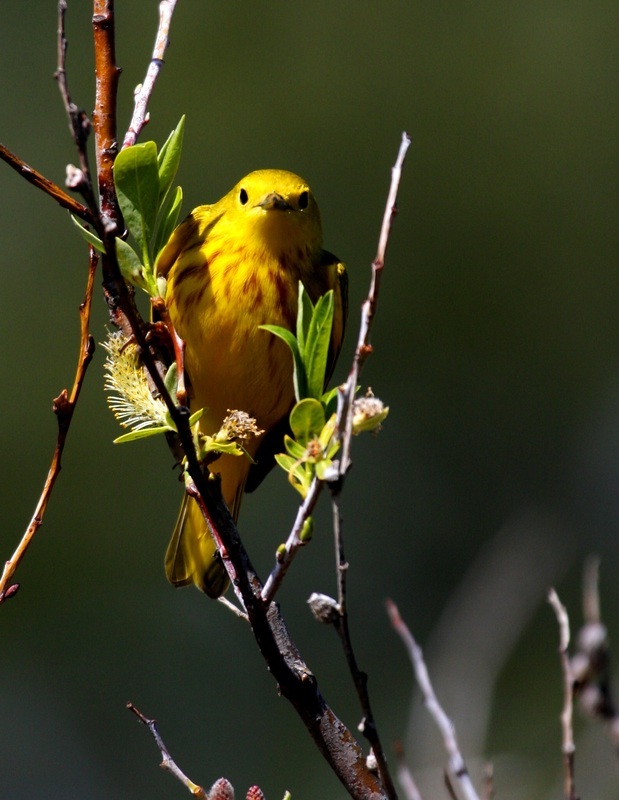 During May, particularly the first half of the month, these areas can attract mixed-species flocks of warblers that, in addition to the possibility of rarities, can include five or six of the usual Central Oregon species. The open water of the Columbia at the mouth of the Deschutes is a good bet for geese and ducks, including snow geese in March, and rafts of scaup from December through March. In addition, along Highway 30 just west of the river, the Deschutes Ponds attract a wide variety of puddle ducks, along with a number of other species, and are well worth checking out when you visit this site. Parking is primarily along wide highway pullouts and the ponds can largely be viewed from the roadway, but you can also walk the area. The alder and shrub stands along these ponds are excellent for songbirds, especially in April and May, and quiet observers may see mink around the ponds. Just to the north, Located on the Columbia River side of the interstate at exit 97, Celilo Park includes an enclosed lagoon (at the boat ramp) that can produce all kinds of waterfowl. The tree-shaded park also offers excellent prospects for songbirds during spring and fall migration, and also provides easy viewing of the open-water habitat on the Columbia. Waterfowl numbers and variety peak from February through April. DIRECTIONS: Follow Interstate 84 east from The Dalles, take exit 97 (Celilo) and then follow Highway 30 east 2.5 miles to Heritage Landing on the west bank and Heritage Park on the east bank. From the east, follow I-84 to the Biggs Junction exit, turn south into Biggs and at the four-way intersection, turn right (west) and go about 5 miles to Heritage Park and Heritage Landing. An outstanding birding site, which comprises several key areas and a variety of habitats, Yaquina Bay at Newport, attracts a wide array of shorebirds, wading birds, seabirds, and waterfowl. The jetties are accessible (the south jetty, by vehicle), sand beaches adjacent to both jetties are public property, the upper bay has various low-tide mudflats, and the bay is even home to the Oregon Coast Aquarium, which has a nature trail with birdy views of a tidal flat and tidal creek, as well as a small aviary. Moreover, because lower Yaquina Bay is narrow, birds are easily seen from prime viewing areas. The bay can produce plenty of surprises, particularly during winter and during migrations. Tim Blount and I were once lucky enough to be fishing in the bay around midnight when thousands of Leach’s storm-petrels invaded; they are nocturnal feeders and breeders, and while we can’t be certain which activity drew them inland in such prodigious numbers, crab larvae were thick at that time. Big storms invariably drive pelagic species inshore, making Yaquina Bay a good bet at such times for shearwaters, northern fulmar, and other offshore species. Beginning in late summer, the mudflats and beaches here are prime real estate for a variety of shorebirds, and the rock jetties are good bets for harlequin ducks from fall through mid-spring. The south jetty is topped with a road that provides easy access for birders and easy viewing of the neck of the bay, which often holds scoters, red-breasted merganser, scaups, harlequin ducks, loons, and other seabirds; at the end of the road, you can park and walk farther out the jetty to check the rocks for harlequins and shorebirds (do not do so in stormy weather and times of heavy seas), or you can walk through the small dunes to the beach, a good bet for shorebirds. Moreover, just east of the bay bridge, a lengthy crabbing/fishing dock reaches out into the bay and can offer close-up views of waterfowl and seabirds. The north jetty is walk-in only, but a spotting scope or a good pair of binoculars allows you to bird the north jetty from the south jetty. Both jetties are on the west side of the Highway 101 bridge. The Oregon Coast Aquarium is on the east side of the bridge, on the south side of the bay, and is well signed. The price of admission is well worthwhile, not only for the displays and the small seabird aviary, but also for the nature trail that leads to overlooks for a tidal flat/tidal creek that almost always produces multiple species and sometimes produces uncommon birds. Also on this side of the bay, on the way to the aquarium, is the South Boat Basin, which frequently holds waterfowl. To the south and east of the South Boat basin and the aquarium, Idaho Point is another must-visit birding site on the bay. To get there from the aquarium, head south on Ferry Slip Road and then turn left (east) on 35th Street (Idaho Point Road). On the north side of the bay, Yaquina Bay Road hugs the shoreline all the way inland to Toledo, and this 10-mile drive can produce a fine list of birds. You can loop back to Newport by continuing from Toledo a short distance up to Highway 20 and then heading west, a route which will pass by several small wetland areas. Just outside of Newport as you head easterly along the bay, the road rounds Sally’s Bend, which at low tide is a vast exposed mudflat an thus a key area for shorebirds, wading birds, and gulls. A remarkably diverse and intact coastal estuary, the Salmon River delta forms where the Salmon River picks up several tidewater creeks and feeds into the Pacific north of Lincoln City. The easiest way to check out the Salmon River estuary is to cross to the north side of the highway bridge over the river and use the pullouts frequented by salmon anglers. a quick scan of the extensive marsh system may reveal any number of species, especially between mid-autumn and mid-spring when many migrants and overwintering birds use the area. For example, all three mergansers occur here, with Common Mergansers being more or less ubiquitous, hooded mergansers nearly always present, and red-breasted mergansers fairly common. On any given day, though, a stop along the highway might yield little to study for birders. So after checking that area, continue north to a west turn onto Three Rocks Road. Bird along the road and then drive in to the boat launch area, which also provides views of the lower river and associated tidal marsh. For the more adept and adventurous, this sprawling delta reveals its bird life more fully--with some difficulty involved--on foot or by watercraft. Much of the entire marsh and associated grasslands are public property. Walking the marsh is not for the unfit because a maze-like network of tidal creeks spreads through the delta and any creek too wide to leap across is certainly to mucky to walk across. The delta mud is gooey—“quick mud” is an apt description. Moreover, the unaware who might try stepping into a 3-foot-wide tidal creek full of tidewater will soon discover the creek is deeper than it is wide. So anyone venturing on foot onto the marsh (from the turnout on the southwest side of the highway bridge), must use caution. The other option is to launch a kayak or canoe at Knight County Park and head back upstream (east) on the Salmon, from which you can detour off into the two largest tidal creeks, which feed the river from the south side of the estuary. If you don’t have a motor, you will need strong paddling skills and a tide table: do not attempt to navigate this estuary during a strong outgoing tide unless you are an expert paddler. Experienced kayakers and canoeists can use the incoming tide to move up into the estuary and then use the ebb tide to ride back to the launch site. Paddling the estuary allows birders to find far more species than does simply stopping along the road, and by walking the estuary I have found the telltale leftovers of where Peregrine Falcons have dined on Short-Eared Owls and ducks, and I’ve also walked up on American Bitterns and Sora Rails. During the prime migration seasons, the estuary attracts myriad duck species, including the occasional Harlequins (especially during stormy weather), as well as an intriguing variety of shorebirds. The marsh serves as an important stop for large concentrations of Common Snipe. DIRECTIONS: From Lincoln City, follow U.S. Highway 101 north, past the Oregon Highway 18 interchange, to the bridge over the Salmon River. Park in the pullouts along the highway just north of the bridge. For foot access, walk south from the bridge to a paved pull-in road and look for the bushwhacker trail leading down into the marsh (this is NOT easy walking so use great care). For boat access, drivepast the bridge and turn left on Three Rocks Road, which leads to Knight County Park and the boat ramp. ponds and parking areas to bird the riparian brush. Winter also brings the possibility of Merlin, not to mention the occasional peregrine falcon and accipiter (especially Sharp-shinned Hawk); Bald Eagles sometimes fly through the area during winter as well. Fall and winter is also prime time for gulls, and the site has produced more or less a who’s-who of Northwest gull species. Gulls and diving ducks, along with loons and a few other water birds, frequent the Columbia River adjacent to the site. The ponds and the adjacent Columbia attract both puddle ducks and divers, as well as a few shorebirds and wading birds, including Black-crowned Night Heron, which have set up a rookery here (at aptly named Rookery Pond, one of the nine ponds at the site). Wood Ducks are abundant, as are Virginia Rail. Warblers abound during spring migration, from late April through late May, and are fairly numerous from mid-September through early October—and vagrant species are always possible. While spring and winter birding is productive any time of day, by June, when hot weather sets in, be sure to visit during the morning hours when songbirds are active, or during evening. The area is laced with maintained trails and has covered picnic tables and vault toilets. 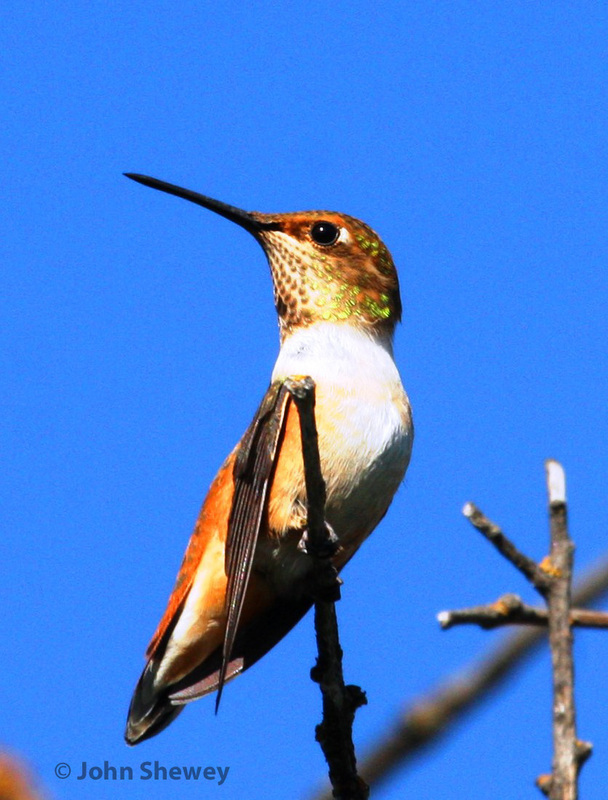 In addition to the main part of the park, the Brownell Blvd./Cline Avenue loop is an excellent area for both songbirds (including winter rarities) and water birds: In Umatilla, a few yards west of I-82, turn north on Brownell heading toward the Umatilla Marina. Turn right on 3rd and then take the first left, again heading south. Bird along the way until you reach a left turn on gravel that goes under the I-82 bridge and leads along a cobble beach on the Columbia back to Umatilla Marina. Otherwise, the best access site for the nature area is the well-signed drive-in access directly across 3rd Street from West Park (check the trees in this park for warblers during May), about one-half mile east from I-82. The Fountain Pond access, a quarter mile east from West Park, also provides immediate access to the trails. Also be sure to check Spillway Park just below McNary Dam (another half mile east on 3rd)—the trees and brush here attract lots of songbirds and the tailwater area is prime for feeding gulls and terns. Directions: From Interstate 84, take State Route 730 or Interstate-82 to Umatilla. Just west of the I-82 exit into Umatilla, turn north on Brownell Boulevard, then turn right (east) on 3rd Street. The access points for the nature area are all located along this road and well signed. Most Oregon birders know that Klamath Marsh is an awesome spot during spring for waterfowl and other water birds (and for a chance to hear Yellow Rails at night), but I imagine few people know that the marsh’s southeast shore—where the marsh transitions abruptly to pine forest—is a prime locale for migrating warblers, and right now is typically a very good time. At the east end of the straightaway that marks the course of Silver Lake Road across the marsh, Forest Road 690 heads south and, for nearly 4 miles down to Wocus Bay, follows the east side of the marsh and is a great place to find migrating songbirds; catch it just right and you may find hundreds of warblers along the road—mostly Yellow-rumped Warblers, but usually with at least a few of the Myrtle form mixed in, along with a few other species. In years past I’ve found Black-throated Gray, Townsend’s, Orange-crowned, MacGillivray’s, and even Hermit Warblers along this road, not to mention prodigious numbers of Kinglets and a smattering of sparrows. 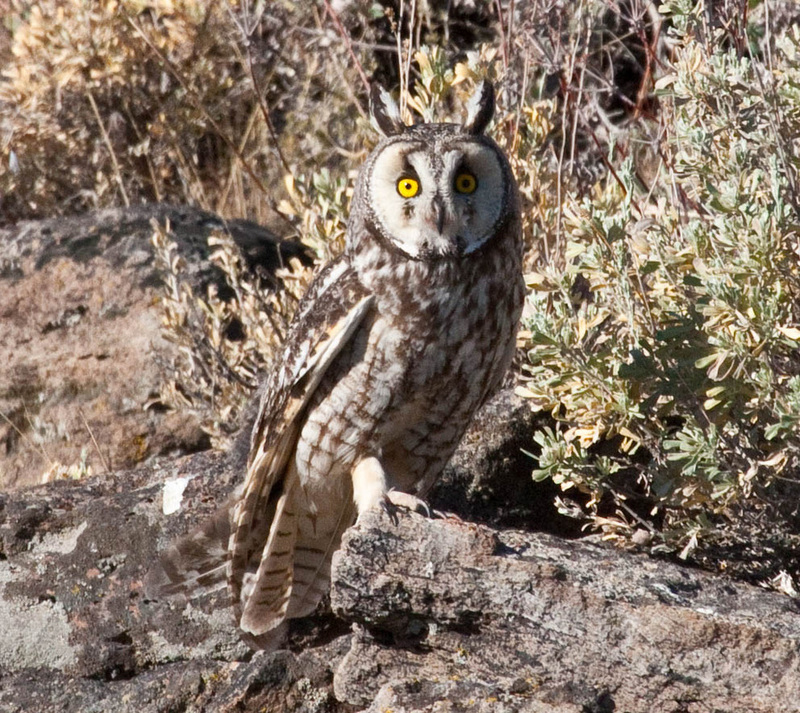 Lucky birders might find a Great Gray Owl. Forest Road 690 is dirt/gravel, somewhat rough in places, and no fun at all when wet, so go now while the dry weather holds. I’m not promising anything, but in years past, the first week of October has been quite good, and last year was epic at exactly this time. Directions: Follow U.S. Highway 97 south from Bend or north from Klamath Falls to the east turn on Silver Lake Road (about 15 miles south of Diamond Lake Junction). Ashland Pond is a small, relatively open, but wooded pond sitting below a residential area in north Ashland. A local school, in conjunction with the city and a local restoration company, removed acres of invasive blackberries from the area around the pond, resulting in an easily accessible, very worthwhile, nearly year-round birding site. 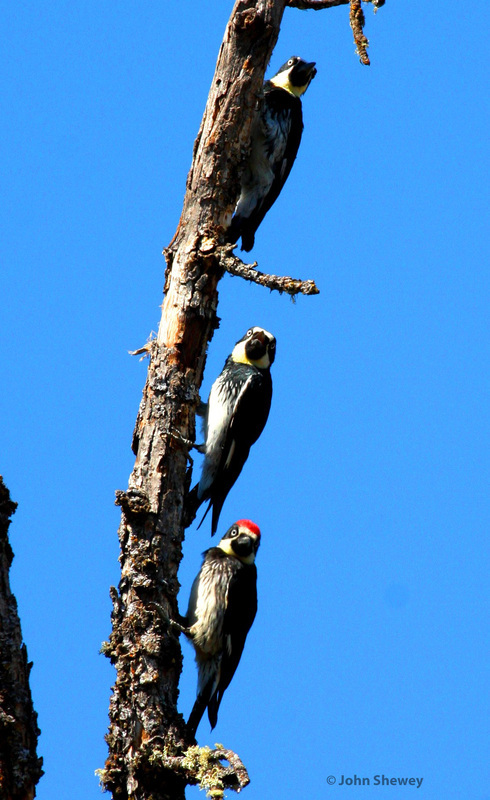 Acorn Woodpeckers are generally gregarious, loud, and easy to watch here, as they frolic about on the dead snags protruding above the willows, oaks, and pines surrounding the pond. In September and October, they are especially fun to watch because they commune as a family and the juveniles have very nearly acquired adult plumage. Moreover, during the fall, this site can produce sightings of every Southern Oregon warbler, while uncommon songbirds found in Southern Oregon are seen here with some regularity. These include Oak Titmouse, Black Phoebe, Blue-gray Gnatcatcher, and California Towhee. Spotted Towhees, Song Sparrows, and Western Scrub Jays are ubiquitous, and keep an eye peeled for Empidonax flycatchers, Rufous Hummingbirds, Lesser and American Goldfinches, and numerous other songbirds. The pond itself, meanwhile, attracts myriad ducks and a variety of wading birds; among the regulars are Hooded Merganser and Green Heron. September and October, however, are somewhat slow for water birds when compared to spring. A gated service road leads about 200 yards down to the pond, and from there a trail circles the pond, and a few short side trails lead into the brush and trees, particularly on the south end by Bear Creek. Residents of the neighborhood often walk their dogs at the pond, so it’s not a bad idea to visit this site first thing in the morning, before anyone is out and about, and save the other Ashland parks, which can be good for songbirds, for afterward. From Main Street in downtown Ashland, turn east on North Laurel Street. Go down the hill and across the tracks; North Laurel jogs to the left and then back to the right, so stay on it until you reach Nevada Street and then turn left. Follow Nevada a short distance to a right turn on Glendower Street. At the end of Glendower is a gated gravel service road, which serves as a foot trail leading a short distance to the pond. Parking is limited to curbside in a residential neighborhood, so be sure not to block driveways.